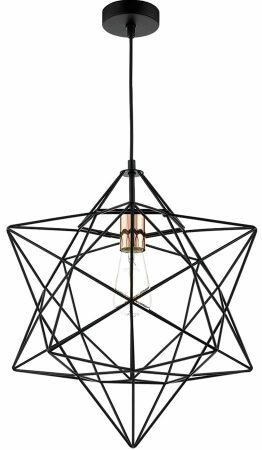 The Dar Luanda 1 light wire star pendant finished in matt black and copper is a great alternative to the traditional lantern. 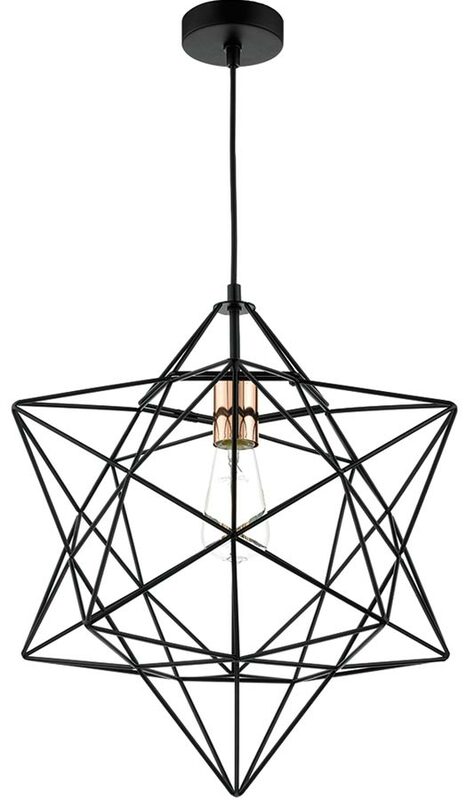 It features a three dimensional wirework star, copper finish lamp holder, with bare lamp inside, all suspended from black cable and circular ceiling mount. This pendant fitting looks equally graceful close to the ceiling or on longer suspension and is suitable for almost any interior styled room with sufficient ceiling height. Perfectly suited to a hallway, vestibule, landing or over a dining table. Height adjustable at the time of installation by shortening the supplied cable, please see the technical data below for the dimensions. Dar lighting is widely recognised as one of the leading suppliers of a full range of innovative, quality lighting products such as the Luanda 1 light wire star pendant finished in matt black and copper you see here.